Portfolio Size: 17 X 13 X 3 in. Presented in a beautifully hand-crafted portfolio box, this collection of loose prints is an "Unbound Book of Art" based on a centuries-old tradition in art publishing. The images included in the collection are as follows: "Bugged Bear", "Christmas Day--Give or Take a Week", "Eagle's Flight", "Escape by a Hare", "Forest has Eyes", "Good Omen", "Let My Spirit Soar", "Missed", "Pintos", "Runs with Thunder", "Rushing War Eagle", "Spirit of the Grizzly", "Two Indian Horses", "Unknown Presence", "Whoo! ", "Wolves of the Crow", and "Woodland Encounter". These 'collector edition' versions of some of Bev's most famous images are smaller in size than their signed and numbered counterparts, but every bit as beautiful! Europeans, especially the French, developed the concept of the book as a work of art unto itself. Over a period of several centuries, there evolved an alliance of artist, publisher, author, designer and printer that controlled all the critical elements — from paper and type to art and binding — that transformed a book into a true objet d'art. The Greenwich Workshop has brought this concept to life again by publishing the collected works of Bev Doolittle in an exciting and dynamic book entitled Where Silence Speaks. 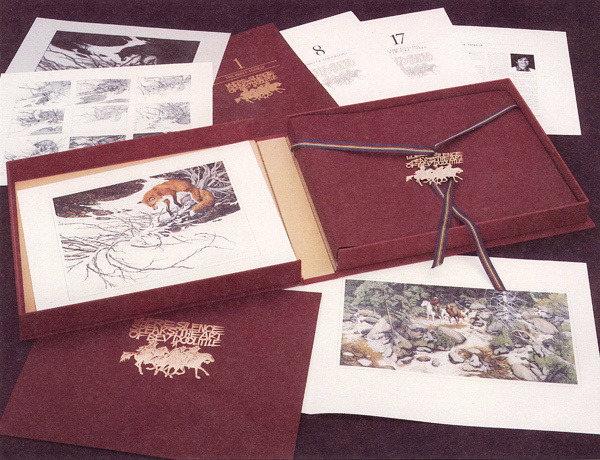 The essence of the book is the 16 works of art by Bev Doolittle. Titles such as "Pintos," "The Good Omen," "Eagle's Flight" and "The Forest Has Eyes" are lavishly reproduced in unbound (in the European tradition) folios. Each is accompanied by text written by author-poet Elise Maclay. But there is much more to Where Silence Speaks — and it invites deep involvement. The book is accompanied by a signed and numbered Bev Doolittle print called "Missed!" In a separate folio within the book, Bev Doolittle fully explains and illustrates how she developed the concept of this work. Sketches — finished and rough, notes and comments, and vellum overlays all detail the creative process used by this unique artist. Designer Peter Landa has placed all the contents into a "chemise." The "chemise" is ribbon-tied and adorned with a gold-tone Bev Doolittle art medallion. The entire contents are housed within a hand bound hardcover portfolio that is velour lined. Finally, all the contents are placed into a solander box. This, too, is in the European tradition. It was the practice to keep small collections and valued objects in a "cabinet" or "solander box" that would protect its contents from light and other harsh elements. Where Silence Speaks is the first book devoted to the art of Bev Doolittle. Innovative in concept, luxurious in creation, it is a book like no other for an artist like no other.